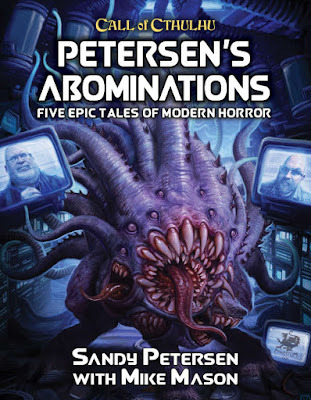 It is rare that you get to see new scenarios from the designer of Call of Cthulhu, but that is what you get with Petersen’s Abominations: Five Epic Tales of Modern Horror. Published by Chaosium, Inc., this new anthology brings together five scenarios set in the here and now that have been designed by Sandy Petersen and run by Sandy Petersen at conventions. Each has been developed from Petersen’s notes and written up by Mike Mason—the Line Editor for Call of Cthulhu, Seventh Edition—so that any Keeper can now run them as one-shots or at conventions. In turn, they take the Keeper and his players to Canada, the Atlantic Ocean, a research facility, a North Sea oilrig, and inner-city Dallas. Each comes with enough pre-generated investigators for six players and sufficient horror and danger to put them in fear of their sanity and their lives, for as Sandy Petersen makes clear, the scenarios in this book, ‘…[A]re usually horrendously violent because people seem to expect and look forward to “being killed by Sandy Petersen in Call of Cthulhu.”’ Also included with each are notes for running the scenario with existing investigators and extending the scenario so that it can played with a normal gaming group as part of an ongoing campaign. It should also be pointed out there is a ‘haunted house’ aspect to three of these scenarios and that not all of the scenarios involve the Mythos—others are simply horror scenarios—but when they do involve the Mythos, they are really are quite horrifying! Petersen’s Abominations opens on a lighter tone, with Petersen explaining how and why the anthology came about and Mason explaining the process of how they worked together. It gives the book a rather personal touch which is continued with a foreword for each scenario. Each scenario is neatly organised with everything needed to run it, plus advice on running it and events to stage as it is being run. All five scenarios are rounded out with six all but ready to play investigators (they just require the distribution of a few points). One issue with these investigators is that in some scenarios, they are not given backgrounds, which is a shame because for one-shots and convention scenarios pre-generated investigators really do need hooks. ‘Hotel Hell’ is the first scenario. It is set in British Columbia, Canada where one of the investigators has inherited an old run hotel out in the middle of nowhere and decides to take his wife and friends there to do it up and run it. From nothing, this is a slow-build affair as strange things begin to happen and escalate—birds flying into windows, strange smells occur without apparent sources, strange paintings are found, and so on—as the investigators look over the hotel and begin work on its renovation until it is very obvious that something really weird is happening. In the main the Keeper will be reacting to what the investigators do and say as they wander around what is a mini-sandbox, because he has few NPCs of his own to roleplay and push and pull the investigators in certain directions. Although there is a link to outside world, it really only serves to emphasis the horrific situation the investigators are in. ‘Hotel Hell’ does live up to its name though and serves as a dependable opener for the anthology. That said, experienced players may find it a little familiar in its structure, so it may not be as enjoyable for them to play through. Once thing the scenario is missing is an image of the hotel that the Keeper can freely use. There is one, but it does depict an event which occurs later in the scenario. If the structure of ‘Hotel Hell’ feels familiar, then the likelihood is that players will have the same feeling with ‘The Derelict’. Devotees of Call of Cthulhu may well be familiar with this scenario as well, as it appeared in print for Free RPG Day 2017. In this scenario, the investigators are passengers aboard a yacht crossing the Atlantic when they come across the wreck of another ship. By law, they are bound to investigate to see if anyone is still alive, but what they find is an abandoned ship and bodies and blood. The question is, what happened aboard this ship and will it now happen to the investigators? If ‘Hell Hotel’ was a haunted house in a hotel, then ‘The Derelict’ is a haunted house aboard a ship—or is it Jaws or Alien aboard a ship? Soon the investigators find themselves being hunted by something faster and stronger than they are and if they are to defeat it and escape, they are going to be inventive! ‘The Derelict’ is nicely appointed with some ship’s deck plans and probably the easiest scenario in the anthology to run as the Keeper only needs to handle the monster. If there has been little to no Mythos in Petersen’s Abominations in the first two scenarios, it makes up for it in the third, ‘Pancea’. The investigators all have connections to or an interest in a pharmaceutical development company called ZyMedBio Corp which recently began conducting tests on human subjects of a new drug called ‘Zylactis’ and the results are looking near miraculous. Yet the strange behaviour of one of these subjects at a party suggests that something else might be going on and so ZyMedBio Corp might warrant an investigation. This scenario has more scope for an investigation—with potentially more clues to find—especially if the Keeper wants to open it up to run longer scenario. It also feels much more traditional in terms of Call of Cthulhu even as Petersen takes a creature drawn from Greek myth and twists it to fit the Mythos. The result may not please purists, but if the result is at least goofy, it is actually a lot of fun. If the Keeper does not open up the scenario, then it feels rather linear, especially once the investigators get into the ZyMedBio Corp building. Of all the scenarios in the anthology, this one has the most potential to develop or be worked into a campaign should the Keeper so desire. Petersen returns to a haunted house situation in ‘Mohole’, but instead of a ship or hotel, the haunted house is on an oilrig in the middle of the North Sea. This has a sort of dated British feel, drawing as it does quite heavily from the Doctor Who of the Jon Pertwee era (there are some very obvious Doctor Who references in here) and Nigel Kneale’s Quatermass, as a scientific team is sent to conduct an audit on a government-backed Top Secret project to drill into the earth’s crust to tap into a new energy source. This situation has it all—weak-willed bureaucrats, obsessed scientists, twitchy security, and bolshie workers as well as machines in danger of overheating and going bang, plus an Old One—and it is the situation into which the investigators are thrown. This scenario has the greatest potential to tip over into chaos as there are a lot of NPCs for the Keeper to handle, especially everything starts to go wrong (and it will!). This scenario very much feels as if it was written to actually go ‘boom!’. A more immediate problem is the lack of backgrounds for the investigators who feel very flat otherwise. It is clear that the scenarios in Petersen’s Abominations have been increasing in their complexity from the first to the fourth, and now the fifth, ‘Voice on the Phone’. Here author brings the Mythos to inner city Dallas and its gang culture, combining a classic H.P. Lovecraft story with the Crawling Chaos for an interesting timed effect. It casts the investigators as members a gang who ordered to deal with a splinter gang which has been making moves recently, expanding quickly and bloodily, with no-one it seems being able to take them down. Alternatively, the investigators might actually be investigators—or rather policeman, part of a taskforce assigned to deal with the increase in gang violence, but no pre-generated investigators are provided for this option. Now investigating as gang members makes for an interesting set-up and roleplaying challenge and as much as it allows the investigators to legitimately get away with applying more direct methods as part of their investigation, it forces them to be subtler in other ways in order to avoid the notice of the police. The other danger in that is that the players are asked to play Hispanic gang members and violent ones at that, so this might not sit well with some players. In fact, this probably the most violent scenario in the anthology, involving as it does a lot of ‘body horror’. The scenario is also quite complex in terms of its timing, so the Keeper really needs to maintain a track of things as the investigators work out what is going on. Get this timing right and the Keeper gets to escalate the Mythos elements in this scenario to great effect. Overall, this is a very good one-shot and should be huge fun to play. Physically, Petersen’s Abominations is well presented in what is now the publisher’s house style. Which means that it is clean, in full colour, has great artwork, and lots of attention has been paid to the player handouts. This is all behind a decent cover which features mugshots of both Petersen and Mason! The book is well written, but it does need another edit and feels slightly rushed in places. One notable omission is the use the NPC collages which put all of their thumbnail portraits in single pieces of artwork thus rendering them utterly useless as props to show the players. This is an enormous improvement over recent books for Call of Cthulhu, Seventh Edition and let us hope that this is a sign that Chaosium has dropped that practice for good. Otherwise, Petersen’s Abominations is an attractive, sturdy hardback which looks great and feels good in the hand. Of the five scenarios in Petersen’s Abominations, the last three scenarios are better than the first two, which feel rather workmanlike in comparison. In particular, both ‘Pancea’ and ‘Voice on the Phone’ stand out as effective pieces of weird body horror and if you get a chance to play these, then you really should. If you are a Call of Cthulhu devotee, then you are of course, going to want to have copy of Petersen’s Abominations on your shelf. After all, this is an anthology from the designer of Call of Cthulhu and they do not come along every day. Fortunately, you do not just get the name with the supplement, but a good set of one-shot scenarios each of which will deliver a sharp, short horrifying gaming experience—even if Mister Petersen is not running them. 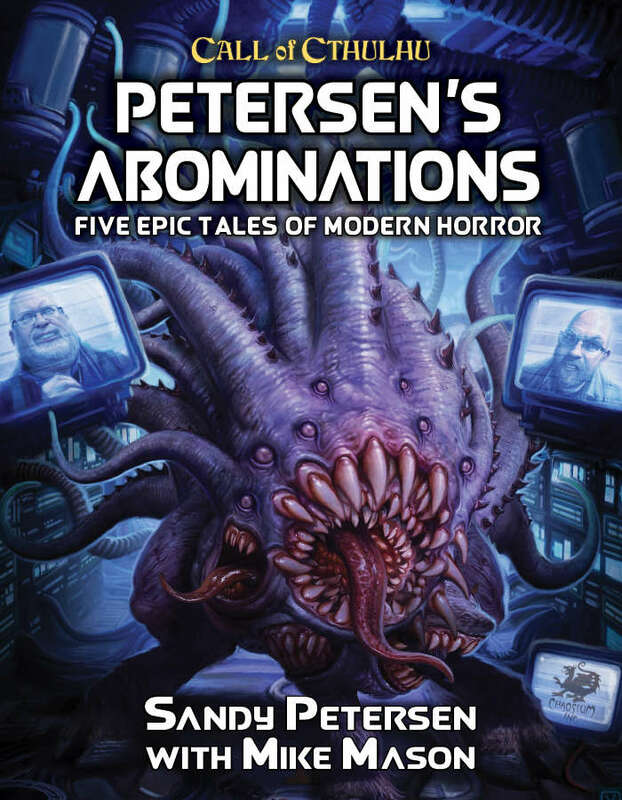 Petersen’s Abominations: Five Epic Tales of Modern Horror delivers some impressive horror one-shots and some fun twists upon the Mythos and shows how the creator of greatest horror roleplaying game can still scare us decades later. Can we have Petersen’s Abominations II, please?